Aneurysm repair can be carried out either via open surgery or using keyhole surgery techniques. Open surgery to repair an aneurysm is a relatively common procedure which has been carried out routinely for hundreds of years. 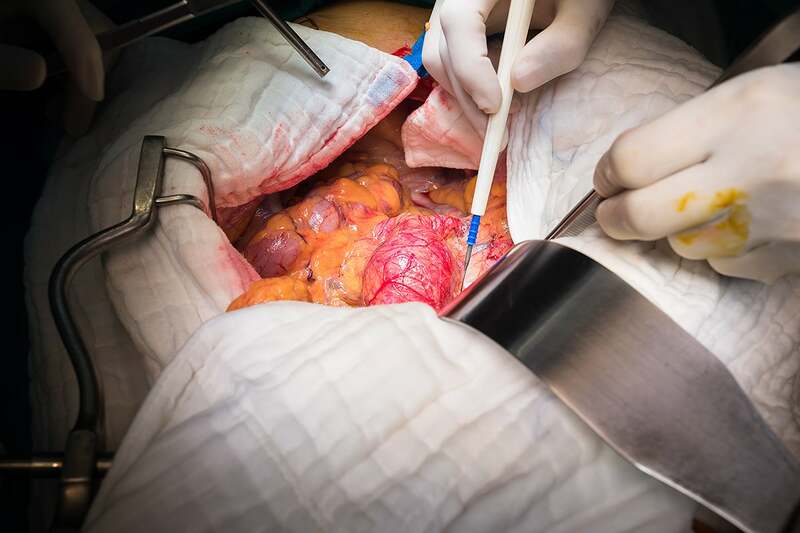 The operation involves a large incision in the abdomen to access the aorta and the replacement of the affected portion of the artery with a graft made of synthetic material (often either Dacron or Teflon), which is matched to fit the aorta and then fixed into place. Aortic aneurysm exposed during open repair. The procedure is carried out in the operating theatre under general anaesthetic and normally takes 2-4 hours. Patients are generally in the intensive care unit for around 24 hours and need to stay in hospital for 7 days or sometimes slightly longer. Complete recovery from the procedure normally takes 2-3 months. It is important that you tell us what medications you are taking, including any supplements or alternative treatments. If you smoke you should stop smoking, either completely, or at least four weeks before the procedure. You may need to stop using any anticoagulants/ blood thinners and Dr Hagley will discuss this with you during the consultation. After surgery, it is important to get out of bed and walk around a little. During the recovery period, you will need to wear graduated compression stockings and will need to take both pain killing medication and anticoagulants.